I modified this Paula Deen recipe to include some smoked sausage. 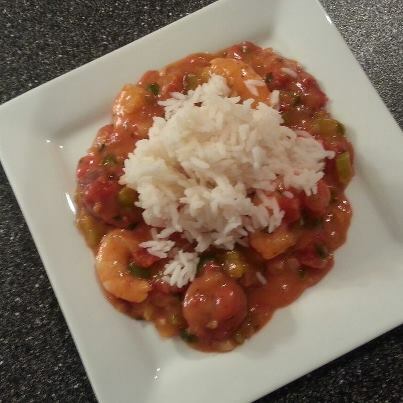 I’ll warn you it is a little spicy so go less on the cayenne pepper and hot sauce if you like things really mild. The clam juice adds a real good flavor to the sauce in this etouffe and the heat was just enough for me to feel it and not be overpowered. I was trying to think of some other way to use some smoked sausage rather than our usual red beans and rice or sweet and sour sausage recipe so I came up with this italian pasta dish. It was really tasty and had that satisfying feeling of comfort food. 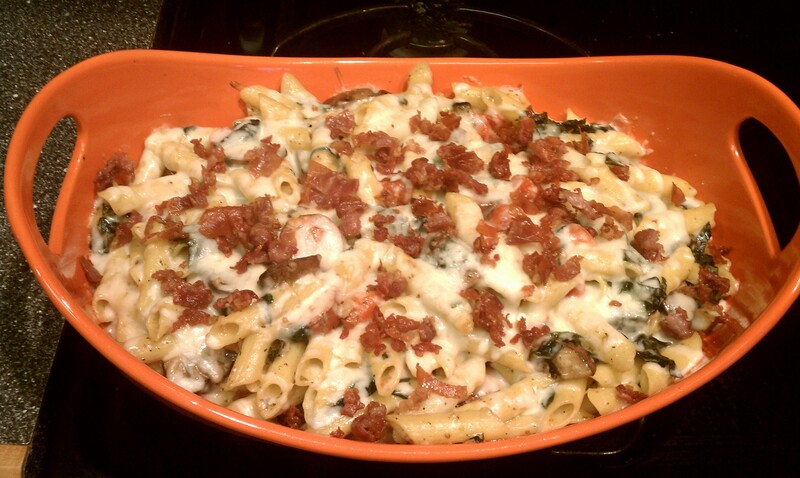 The smoky sausage and crispy prosciutto added a really nice flavor to the veggies and pasta. Toss tomatoes with 1T of olive oil and season with salt and pepper. Roast in a 400F oven on a baking sheet for 10-12 minutes until softened and then set aside. Boil pasta according to directions on package. Spray a casserole dish with non-stick cooking spray. In a large dutch oven or pot on the stove heat 1T of olive oil over medium-high heat. Add prosciutto and cook until crispy. Drain with slotted spoon and set on paper towels. Cook sausage slices in same oil until browned on both sides and then drain on paper towels. Next add your mushrooms and garlic pot and season with salt and pepper. 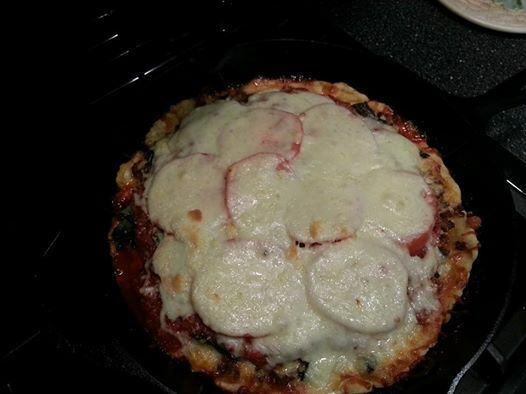 Cook for 2-3 minutes and then add spinach. Cook for another 1-2 minutes until spinach is wilted. Drain pasta and add to the pot with veggies. Add sausage, tomatoes, parsley, basil and parmesan cheese. Cook for 1-2 minutes. Pour pasta into casserole dish and cover with mozzarella cheese. Cook in oven for 3-5 minutes until cheese is melted. Have you ever found recipes on products and then stick them somewhere and never use them? A couple years ago I came across this sausage stuffing recipe and have never made it so this year, in addition to our wonderful squash dressing, I’m going to make the Tennessee Pride Sausage Stuffing with the addition of apples. My family can chow down on the dressing and the stuffing so this will be a great addition to the menu. Preheat oven to 350F. Cook the sausage in a large skillet until browned and drain on paper towels. Cook onion, celery, rosemary and apple in sausage drippings until tender. Combine sausage, vegetables, parsley, seasonings and bread in very large bowl and mix well. Stir in chicken broth to moisten stirring well. Pour stuffing in greased 13X9 baking dish and dot with butter. Cover and cook for 30-40 minutes. Uncover and bake for 10 more minutes until golden brown. What is your favorite stuffing/dressing recipe? I adapted this recipe from one by Nigella Lawson and it was very good. The sausages we used were especially yummy. It’s a quick way to make a one pan main dish for dinner that your family will enjoy. In a large ziploc bag combine oil, mustard, worcestershire sauce, dried sage, pepper and onion. Cut lemon in sixths and squeeze juice into bag and then add the lemon wedges too. Mix everything in the bag around and then add your chicken. Seal the bag and then slosh it around a few times to get the chicken coated with the marinade. Leave in the refrigerator for 3 hours or overnight if you can. Let chicken come to room temperature and then preheat oven to 400F. 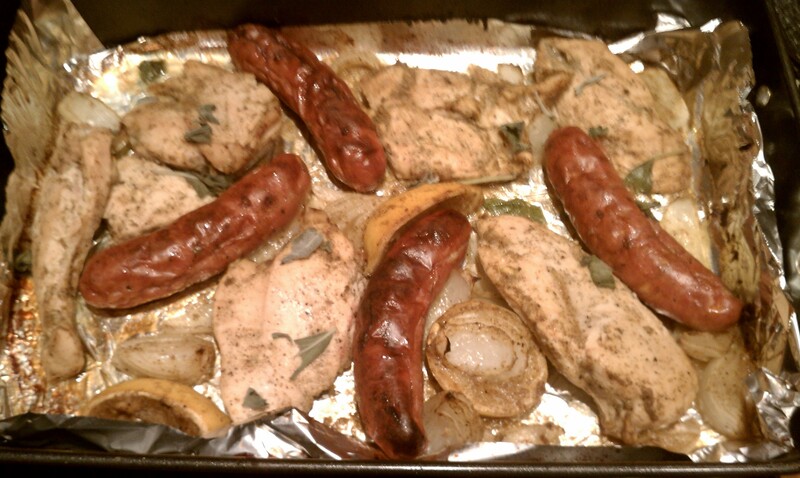 Arrange chicken with marinade items in a roasting pan and add sausages around everything. Sprinkle the fresh sage over the top and then cook for 40 minutes turning the meat over halfway through cooking.